As an event organiser, you want an efficient way for clients/guests to book and securely pay for your events. You may also want a system which will e-mail event tickets to the attendees. What about admission to the event itself? Do you want the hassle of scanning lists of names? Do you want a long line of impatient attendees to grow as they wait for their tickets to be checked manually? Enter the Ticket Scanner App. 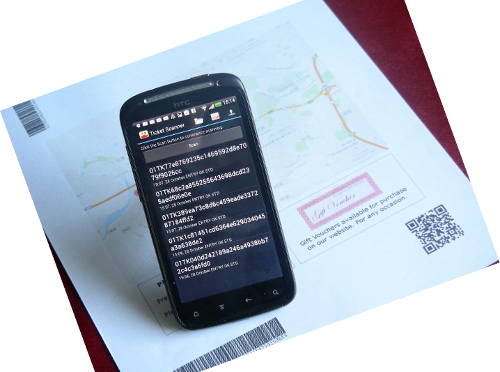 This is an efficient way of scanning and validating tickets using your smartphone or tablet computer. Because it is validating the tickets against a list of known valid tickets, it reduces the chances of human error and speeds up the admission to the event. Prior to the start of admission, the operator selects which event occurrence to scan for and downloads the ticket information from the server to the phone/tablet device — an Internet connection is required for this step. The scanning operation does not require an Internet connection and so can be done in areas of no or poor network connectivity. The software uses the smartphone/tablet’s camera to read the barcode or QR-code of the ticket and validates it agains the previously downloaded ticketing information. Invalid tickets are highlighted to the operator with an appropriate message and device vibration. When scanning is completed, the operator can upload the scanned ticket code information to the server with a button press so that attendance can be tracked. This step requires an Internet connection.